The Endomedix Biopolymer Technology is based upon two biopolymers (polysaccharides), dextran and chitosan. Each of these natural materials is processed separately and put into separate aqueous solutions. For application, these two precursor solutions are simultaneously mixed and applied to a target surgical site, where these solutions form a hydrogel device in situ. These solutions can be applied as either a spray or a flowable liquid. The hydrogels produced with the Endomedix system are strong, conformable, pliable, biocompatible, biodegradable and adherent. Importantly and uniquely, these hydrogels do not swell as do other hydrogels and most materials when placed in a liquid environment of blood, cerebral spinal fluid or saline. Instead these hydrogels shrink predictably as a result of the unique patent biopolymer chemistry. The capacity of variants of our biopolymer system to deliver drugs and stem cells to target sites has been demonstrated in preliminary studies. 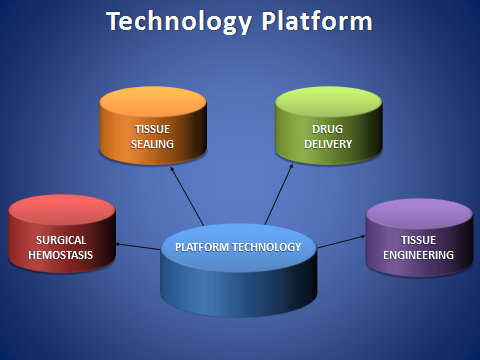 The adaptability of the Endomedix biopolymer system allows it to become a technology platform for several different medical product groups as is illustrated below. The Endomedix Biopolymer System is protected by a series US, Canadian and European issued patents. The technology is also protected because Endomedix uses a custom-made and highly specific chitosan. Also, Endomedix has developed advanced spectroscopy technology and a quantitative model for the control of its processing, which represent a further barrier to replication of its technology by others.